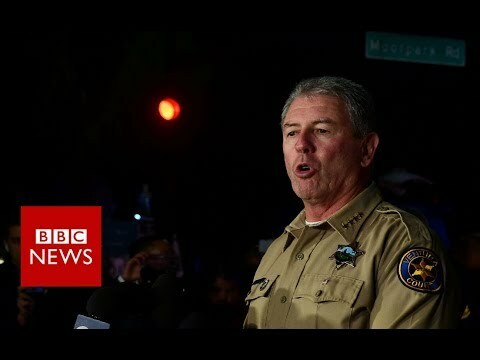 At least 12 people have been killed, including a police officer, at a bar in Thousand Oaks, California. Reports say the shooting began at about 23:20 local time on Wednesday at the Borderline Bar and Grill about 40 miles (65km) north-west of Los Angeles. Another 10-12 people were injured in the attack. Please subscribe HERE http://bit.ly/1rbfUog Police say there are "multiple fatalities" after a shooting at a bar in Thousand Oaks, California. Reports say the shooting began at about 23:20 local time on Wednesday at the Borderline Bar and Grill about 40 miles (65km) north-west of Los Angeles. Officials have confirmed the suspect is now dead, and have said there were at least 11 victims in the attack. At least 200 people were reportedly inside the bar attending a college country music night at the time. "When deputies arrived they heard shots being fired, it was an active shooter situation," Ventura County Sheriff's office spokesman Eric Buschow said. "They entered the location and I can tell you there are multiple fatalities, multiple injuries, among the victims is one of our sheriff's deputies that responded in that initial call, as well as the shooter." Police have said the number of injured is expected to rise.